In a narrative interwoven with fairytales, the lines that divide memories from dreams blur in Mama & the Hungry Hole. Julia is 4-years-old and her Mama has stolen her away to the mountains of northern New Mexico where everything is unfamiliar and everyone is unknown. Lonely and often forced to take care of herself during Mama's many "quiet times," Julia befriends a tree. Tree has been around longer than anyone and witnessed the village change from thriving ranching town to hippie commune to bedroom community. When Julia's Nana comes to visit and a traveling Circus moves in next door it seems like everything will change for the better, but Tree is the first to notice the eerie sensation of nothingness deep beneath its roots. "DeBiase's exquisitely crafted debut novella straddles a line between magical realism and metaphorical truth in a story that explores ties among three generations of women, the persistence of innocence even in the most desperate of childhoods, and the transformative power of stories and dreams...DeBiase's storytelling, both in the overall narrative and in the actual tales her characters tell, deftly excavates the beauty in brokenness and the strange sweetness in sorrow." "Loss, family-forged shackles and bonds, and the power of storytelling, are at the splintered heart of this engaging debut novella. DeBiase poignantly renders the mystery, magic and terror inherent in nature and childhood., and does so with vigorous simplicity. In what amounts to a deftly executed balancing act: charm holds hands with tender sorrow; reality dissolves inside of dreams; and peeled layers reveal deeper mysteries. Or to spin it another way: an existential fairy tale for insomniacs." 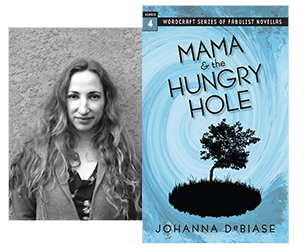 "Johanna DeBiase's Mama & the Hungry Hole excavates the innocence and despair of the liminal child. As activist as it is feminist, DeBiase follows the abrupt agony when the body is confronted with death. Here, mourning yields potent escapism and Mama & the Hungry Hole is a magical curse that we dare not stop reading." Johanna DeBiase writes from New Mexico where she is spellbound by the energy vortex of Taos Mountain. Originally from New York, she earned her BA in Literature and Creative Writing from Bard Collage and her MFA in Creative Writing from Goddard College. Her short fiction has been published online and in print including Portland Review, theNewerYork, Monkeybicycle, Convergence, Prick of the Spindle and San Antonio Current. She has also received scholarships to attend San Miguel Writer's Conference, Vermont Studio Center, and Rensing Center. The rest of the time, she is a certified yoga instructor , vintage clothing boutique owner and mother of one.